Nevada or Nan Conwy, BBC? I'm sure that few will be shocked at the revelation that I am not a great fan of the Labour Party, but having said that the Welsh branch of the Labour Party held its pre Assembly Election Conference in Llandudno this weekend. If Labour win the next Assembly Election (of course I hope they don't, but IF) a lot of aspects of my life will be influenced by Welsh Labour. I am forced to buy a BBC TV licence in order to view BBC broadcast news, so I know what's occurring, I don't think I got my money's worth this weekend as a Welsh viewer. 100% of the sparse coverage of the Welsh Labour Conference was about the EU referendum 0% was about the Welsh General Election. I saw more coverage of the US Democrat / Republican elections on the BBC than I saw of coverage of the National Assembly Elections; I saw more coverage of the US Caucuses than I saw of the Welsh Labour Conference. The BBC has a legal remit to Educate and Inform; it is failing in that duty when it ignores Wales in favour of a foreign election! I know what Trump, Clinton, Saunders, Cruze etc had to say in Nevada, but I don't know what Carwyn said in Llandudno – that isn't Welsh News that isn't coverage of Welsh Democracy it is an unequivical fail by the BBC to respect Welsh politics! One of the bugbears that I have had with Plaid Cymru is that its main aim is winning votes rather than making the case for Welsh Nationalism, the formation of The Welsh Language Society in the 1960s helped Plaid because it took campaigning for the language out of Plaid's main remit. I have noted in many posts on this bolg that I believe that there is a need for a "campaign for Welsh independence" outwith the party political sphere; it appears that my wish might be granted in the formation of a new organisation YES WALES which is launching it's campaign on Saturday. I am unable to attend Saturday's event, but I wish it every success. 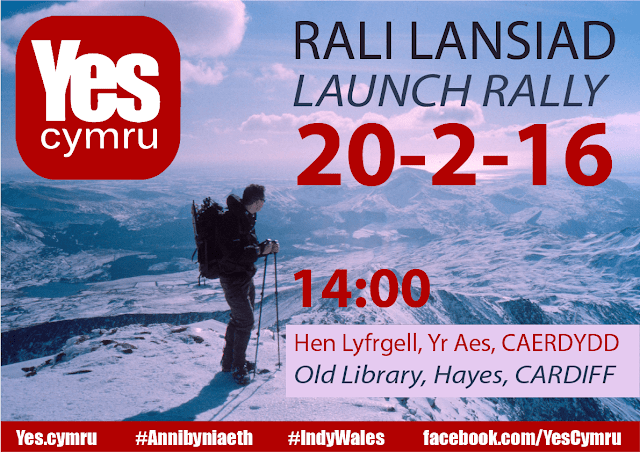 If a local branch is formed in the Conwy Valley after the National launch - I will do all I can to support it! Wales benefits from being part of the EU, economically, socially and culturally. The EU helped to establish peace and keeps the peace in Europe: a role that should never be underestimated and which we value. study and work in other countries and learn new languages. These are just some of the advantages to Wales. And thanks to the EU we have laws on equality, on the environment, on workers' and consumers' rights, on farming and food quality, to tackle climate change and much more. The United Kingdom already opts out of the Schengen travel area, which is why we still have passport control at the UK's external borders. And of course we never joined the single currency. European Free Alliance and progressive colleagues across the EU. That is how we will get a more open, democratic and effective Europe within which Wales will play its full part.